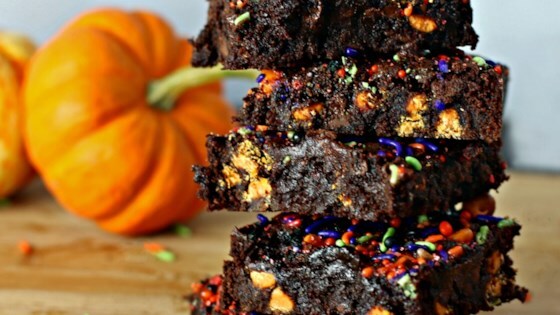 "These 4-ingredient pumpkin chocolate chip brownies are the moistest, most incredibly rich and gooey, best chocolaty brownies with pumpkin chocolate chips you will ever make! Fun Halloween dessert!" Preheat oven to 350 degrees F (175 degrees C). Grease an 8-inch baking pan with 2-inch sides. Stir brownie mix, butter, and eggs together in a bowl until just blended. Stir in pumpkin spice morsels gently. Spread batter in the prepared pan. Bake in the preheated oven until top is dry and edges have started to pull away from the sides of the pan, 25 to 30 minutes. Scatter sprinkles on top. Let cool before slicing and removing from the pan, about 30 minutes.